So we decided to find out about the sponsor. Officially, the team is called EF Education First—Drapac P/B Cannondale, to get all of the team’s supporters’ names in there, but Education First is—well—first. Founded in 1965 and headquartered in Lucerne, Switzerland, the company organizes student trips and teaches English around the world. It has regional offices in Cambridge, Mass. and eight other cities worldwide. Among its activities are co-sponsoring summer trips to Finland, with the Council of the Chief State School Officers, for a select group of state teachers of the year, who then travel on to the company’s Global Leadership Summit. It also has released a global study of proficiency trends among English-language learners. A Boston Globe story five years ago explained that the company was launched by Bertil Hult, a two-time dropout (junior high school and college) with dyslexia, for the equivalent of $700. Today, the organization has 46,500 people working with it across 580 offices and schools in over 50 countries, according to a spokesman for EF Education First. The business grew to this size organically, according to founder Hult. He told the Globe that he built his business without accepting money from outside investors, “relying on an eye for savings and drive for efficiency,” the Globe reported. EF bought naming rights to the team last year, according to the company’s announcement at the time. 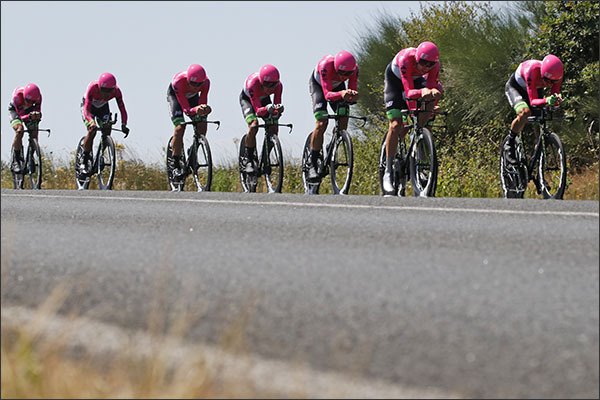 “We were inspired to step in and become the team’s title partner, and will become majority owner, after learning about the #SaveArgyle campaign and witnessing the incredible outpouring of support from fans around the world,” Edward Hult, CEO North America, EF Education First, said in the official release. The team now uses the hashtag #PinkArgyle. “We have been moved by the powerful way that cycling unites people of diverse backgrounds in a peaceful, fun, and friendly way to achieve extraordinary athletic feats,” Hult added. “It aligns perfectly with EF’s mission of opening the world through education and our commitment to bringing different cultures together.” The company did not indicate how much it paid for the team. “Hundred of millions of dollars have been sunk into cycling teams in the past five years, with minimal return coming back,” Spencer Martin wrote in 2017. The story featured this very team, which indicated that it had announced a new partnership with Verizon media subsidiary Oath Inc. at the very last minute. “It came as a relief for the team, which had been struggling to secure a stable title sponsorship and has slipped down the budget ladder hierarchy over the past few seasons,” Martin wrote. But apparently, Oath didn’t re-up its sponsorship. Former professional cyclist and manager of the team Jonathan Vaughters wrote in Business Insider last year about its latest scramble to find a sponsor for naming rights. Cyclist wrote that $7 million was needed to give the team a run at the WorldTour this year. While it’s unclear how much EF Education First has contributed, it was enough to get them to the starting line—and, according to the company’s statement, well beyond. Now, let’s see who wins. UPDATE: This post has been updated with a statement from EF Education First about why it purchased the team, and with additional details about the company.